SYRIZA's mild Keynesian programme has been gutted. Is a more democratic economic alternative possible within the framework of the EU? SYRIZA’s victory in the Greek elections of 25 January raised a wave of hope across Europe. The dominance of the austerity-oriented conservative and social democratic parties was at last challenged by the victory of a leftist anti-austerity party, signalling a possible change of course in Europe. But one month into a SYRIZA-led administration, the prospects look much gloomier. SYRIZA is committed to Greece remaining within the Eurozone, and that requires the agreement of several powerful institutions (EU, ECB, IMF) and the tolerance of the core economic elites of Europe. This was not forthcoming. The new Greek Government was quickly challenged by a liquidity blackmail originated by the ECB and supported by the German government and the EU leadership. It soon became apparent that even mildly reversing austerity and prioritising the tackling of the humanitarian crisis – the main pillars of SYRIZA’s Keynesian programme – have no place in the EU as currently constituted. In late 2014, the previous coalition government of conservatives and social democrats refused the EU Commission’s offer to extend the bailout programme until the summer asking an extension until the end of February instead. In this way, the newly elected government faced an immediate liquidity danger and was forced into a negotiation with the EU under unfavourable terms. After repeated Eurogroup meetings, the new government practically gave up on the bulk of its programme so as to buy some time (four months). 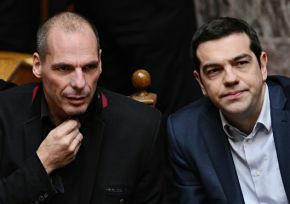 According to the common Eurogroup statement of 20 February, and the letter of the Greek Finance Minister Yanis Varoufakis of 23 February, with the first commitments the Greek government agreed to leave practically untouched all privatisations and the majority of the budget cuts of the last four years and practically committed not to intervene to the banking sector. All the sovereign debt is recognised as payable. The Troika’s labour market deregulation laws are to be carefully evaluated, and partly changed, but definitely not reversed. The raising of the national minimum wage will be subject to the approval of the EU, while further wage cuts in the public sector are not excluded (without adjustment of the wage floors). The government is committed to abandoning all possibilities of early retirement, meaning the neoliberal pension reforms remain, while the already-realised pension reductions and the implementation of the pay-as-you-go system of the previous governments must remain untouched. The abolition of Troika’s ‘Memorandum of Understanding’ (MoU) was the most central element of SYRIZA’s political campaign since 2011, and is the basis of the mandate it received in the recent elections. Yet the new Eurogroup agreement refers to the MoU as the ‘existing arrangement’. Moreover, EU Commissioners and Eurogroup’s Chairman Jeroen Djisselbloem publicly claimed the deal is about the extension of the MoU. The SYRIZA-led government managed to avoid, for the moment, some of the remaining demands of the Troika under the MoU – like further reductions in pensions and changes to the laws on strikes and the funding of unions – but failed to abolish the bulk of it. It got an extension of the same loan agreement – without any renegotiation of its characteristics – and the MoU will be evaluated with Varoufakis’ aforementioned letter as the ‘starting point’. Nothing prevents the EU from coming back and insisting on the implementation of all measures included in the MoU, even if they are not in Varoufakis’s list, whilst the IMF has objected that the Greek letter ‘is not conveying clear assurances that the Government intends to undertake the reforms envisaged in the Memorandum’. It notes in particular the commitment in the MoU to pension and VAT reforms, to opening up of closed sectors and privatisations, as well as administrative and labour reforms, and it emphasises that the ‘completion of the review’ cannot ‘be successful […] within the policy perimeters outlined in the Government’s list’. ‘Restoration of the minimum wage to €751‘ from the first days and for sure within the first year. ‘This includes the ambition to streamline and over time raise minimum wages in a manner that safeguards competiveness and employment prospects. The scope and timing of changes to the minimum wage will be made in consultation with social partners and the European and international institutions, including the ILO, and take full account of […] whether changes in wages are in line with productivity developments and competitiveness.’According to the government’s announcements in Parliament minimum wage is expected to reach €751 in 2016. The first pillar of the Thessaloniki programme was a €2 billion bill to deal with the humanitarian crisis. This included free electricity and food support to 300,000 households living in poverty, free healthcare to all, and subsidised rent for tens of thousands of citizens to combat homelessness. It also included the restoration of the so called thirteenth pension (end of year bonus) for pensions below €700. Now any decision impacting on the budget can be vetoed by the EU. On the top of that, the government has committed to paying €22 billion on servicing the debt this year and still coming out with more than a 1.5% budget surplus. Each 1% of fiscal surplus means €1.8 billion less for humanitarian relief. In addition, non-salary and non-pension government expenditures are to be ‘rationalised’. In a second letter sent by Varoufakis to the Eurogroup on 6 March 2015, the cost of the programme is reduced to 200 million. Free electricity will finally be provided to only half of the households programmed (150,000) while the provision of free healthcare and the ‘thirteenth pension’ have disappeared. All the cost is supposed to be covered by cuts in the expenditure of government ministries and a new system of public tenders which is expected to save €140 million. The second pillar of the Thessaloniki programme was about ‘restarting the economy’ by halting the ‘tax repression’ of the economically active part of the population. The backbone of this pillar was the plan to help citizens with tax debts by breaking them into small (100) instalments, writing-off about half of these debts for those that pay up to April, restoring the limit of tax free income to €12,000 a year and cancelling the housing tax for small housing properties. However, the EU is expected to add many conditions to these measures, with which the government had estimated it would receive €3 billion in revenues in the first year. In the second letter sent by Varoufakis, writing off parts of tax arrears is replaced by ‘strict payment discipline’ as in the similar programme that was put forward by the previous government and finally rejected by the Troika. The likely beneficiaries are also reduced since whoever misses a payment is now excluded automatically from the programme. The other flagship measure of the second pillar was the restructuring of ‘bad loans’ made by banks to households and businesses. SYRIZA proposed creating a public body that would buy and restructure this debt (which amounts to €77 billion) using €3 billion from the Hellenic Financial Stability Fund (HFSF). But this proposal has already been killed off by the Eurogroup deal, which made clear these funds ‘can only be used for bank recapitalisation and resolution costs’. In any case, these funds have in fact already been returned to European Financial Stability Facility (EFSF)/ European Stability Mechanism (ESM) and Greek banks can apply directly to the ECB/SSM by the end of June to use them. But even if the Greek government could use these funds, they would still be insufficient to deal with the volume of the bad loans. The third pillar of SYRIZA’s programme is referred to as ‘re-conquering labour’, and is perhaps the one most fatally undermined by the Eurogroup deal and Varoufakis’s letter. Since the government agreed to refrain ‘from any rollback of measures […] that would negatively impact […] economic recovery […], as assessed by the institutions’, any re-establishment of the collective bargaining system and arbitration mechanism that was demolished by the Troika would surely be vetoed. In the place of the old system, the Varoufakis letter talks about ‘a new “smart” approach to collective wage bargaining that balances the needs for flexibility with fairness’. The creation of 300,000 new jobs and the provision of 300,000 new unemployment allowances are now out of question, especially given that the €3 billion expected from tax reforms will be lost to servicing the debt and achieving a budget surplus. In line with the 2011 Euro plus pact, Varoufakis’s letter pledges that ‘changes in wages’ will be ‘in line with productivity developments and competitiveness’. With no investments in sight to improve productivity, and no other factor to drive Greek capital’s competitiveness other than low wages, this effectively rules out any wage increases. Prospects are bleak for the public sector workers as well. Varoufakis’s promise to freeze ‘the public sector’s wage bill’ and deliver ‘wage distribution through productivity gains’ means any improvement in the €600 salary that newly appointed doctors and teachers now receive, forcing them below the poverty line, is unlikely. The Greek public sector has lost more than 200,000 employees since 2010, resulting in the radical degradation of basic services to the people. One of SYRIZA’s electoral pledges was to hire back around 4,000 people who were illegally fired by the previous government. Now it says these people will be included in the 15,000 public sector jobs the previous government announced it would create. The Greek public sector needs much more of a boost on recruitments to become functional again. An indication on the direction of the compromises that were made by SYRIZA is given by the position of the Greek employers. While SYRIZA enjoys massive support among the working class around the country, it was the Federation of Greek Employers (SEV) who saluted the measures in Varoufakis’s letter and called citizens to ‘support the government’s agenda with fortitude and faith’! What comes after the four month period? This four month programme extension will unfortunately not be the end of the EU’s tutelage over Greece. According to the government, this is only a bridge programme to be replaced in June by a permanent ‘contractual agreement’. Greece’s unsustainable sovereign debt will need fresh cash to be serviced, and European tax payers will once again be forced to contribute to this black hole. There is little prospect that any new economic programme attached to a new loan will be a programme for growth and social justice as SYRIZA would like. On the contrary, it will likely have the same characteristics as the existing austerity programme. Within this framework, it is difficult to imagine any improvement in Greece’s most extreme socio-economic problems; namely the 1.3 million unemployed, the 60% of working people unable to make ends meet, the three million people with no access healthcare and the lack of public investment which has led to a lost generation and a generalised feeling of depression. Since it is actually questionable whether the Thessaloniki programme would be enough to put an end this social and economic disaster, one can only imagine what the consequences will be now that even this programme has been gutted. If one thing has become clear, it is that the long-expected change of course in Greece and the EU more broadly, will not come just because SYRIZA has come to power. The question that emerges is whether things could have gone, and can still go, differently. Is it possible for a left government in an austerity hit country to apply even a mild Keynesian policy while remaining within the eurozone and the EU? The answer is simply NO! The EU institutions under the leadership of Germany have used all the means at their disposal to force the Greek government to backtrack from its programme. Without new loans, Greece can’t service its existing debt, and the ECB (acting on behalf of the EU) has already threatened to cut off liquidity to enforce harsh neoliberal reforms, as it did in negotiations with Italy, Ireland and Cyprus. In addition to the financial ‘weapons of mass destruction’ (liquidity and debt), the EU has numerous tools to discipline governments deviating from austerity policies, even when it hasn’t bailed them out. The rules of economic governance in the EU give the European Commission the ability to review the yearly budgets of the countries, and to demand changes and apply fines to countries that deviate from its recommendations. They can also freeze the structural funds for a country that does not follow their recommendations on reducing deficits and sanctions can now also be imposed on countries for not dealing with ‘a macroeconomic imbalance’ the way the Commission recommends. One of the rules imposed is the capping of the growth of nominal labour unit cost at 9% for Eurozone countries and 12% for non-Eurozone countries for three consecutive years. This effectively bars the redistribution of GDP from capital to labour through wages. Such rules of economic governance are based on hardline neoliberal principles, and their interpretation is at the discretion of the organs of the EU (i.e. the European Commission) which are not subject to any democratic control. Legislation on ‘competition’ and liberalisation also prohibits treating energy, mass transport, telecommunications or finance as public services. In this context, there is just no room for manoeuvre for even a mild Keynesian economic programme. Opposition to the dominant EU project has been on the rise not just in Greece, but also in Spain, and to a lesser extent in other countries too, like Slovenia and Portugal. Left-wing forces have invested politically in the idea of pushing for progressive reform of the EU. However, the demands of the social movements that these forces seek to represent – for more democracy, more commons, less unemployment and precariousness, work with rights and a more decent life – are clearly in contradiction with the political, legal and institutional structure of the EU. What strategy then should be followed vis-à-vis the EU by political and social forces that aim to break with neoliberalism? Changing the legislation on economic governance and infrastructure liberalisation would require a ‘qualified majority’ in the Council, while overcoming the European Fiscal Compact and other treaties would require unanimity. We can be sure the socio-political conditions will never be favourable for the radical left to form governments in 16 out of the 28 countries, representing 65% of the EU’s population. Applying disobedience to current EU treaties and legislation, therefore, is the only way for left governments to follow different policies. Moreover, several institutions with substantial financial and political power (the European Commission, the European Central Bank and the European Stability Mechanism) lie beyond any immediate democratic control, and will always be able to take action against any undesirable political change at the EU level. The only way for (radical) left governments to overcome these constraints is to regain monetary power by introducing national currencies under democratic control. This would also require abolishing the ‘independence’ of their central bank and re-appropriating the capacity to create their own liquidity. Such a programme should also include the nationalisation of private banks and the introduction of capital controls to avoid capital flight and find resources for job-creation and public investment. Finally, it would require an end to the servicing of sovereign debt and an invitation to creditors to negotiate on this basis. The necessary requirement for a left political programme to succeed is that the political power of the forces it represents must extend further than the government. It must be deeply rooted in mass movements and have the active support of the people. Left movements must go much further than trying to ease the suffering caused by neoliberal policies, and aim at building an economy orientated towards serving the majority of people, while respecting the planet and the needs of future generations. For a programme to be successful, an alternative vision must take roots in the hearts and minds of people, and this can only happen if it is concretely put in place with grass-roots initiatives and cooperative local economies leading the effort. Greece now has four months to decide whether it wants to continue under the austerity straightjacket imposed by Schauble, Dijsselbloem, Draghi, Juncker and Lagarde, or to show the rest of Europe that a different path is possible. The Left all over Europe should take note of the severe constraints that an anti-austerity government faces within the Euro and the Treaties. Juncker has remarked that ‘there can be no democratic choice against the European treaties’ – if he is right, it follows that a genuinely democratic economic alternative will only be possible outside of the framework of EU. Dimitris Pavlopoulos works as an assistant professor at the department of Sociology of the Free University of Amsterdam. His research concerns the socioeconomic consequences of flexible employment. Yiorgos Vassalos is a political scientist specialising in interest representation in the EU. He worked for six years for Corporate Europe Observatory and is now writing his PhD on financial lobbying. He is also active in anti-austerity movements. The government engaged ‘to refrain from any rollback of measures and unilateral changes to the policies and structural reforms that would negatively impact fiscal targets, economic recovery or financial stability, as assessed by the institutions’. The HFSF is a private legal institution that has the task of controlling the stability of the Greek banking system. Its foundation in July 2010 was part of the bailout agreement with the Troika. The Structural and Cohesion Fund are the instruments of European Union (EU) regional policy. Ratio of nominal compensation per employee to real GDP per person employed.